Recently my family wanted to grow some plum trees. I already have a few Nectarine and Peach trees out the back of my house but not a lot of room to plant some more varieties, so I asked my Dad who is a keen gardener and expert grafter, if he would like to teach me, How to Graft plums onto my existing trees. Think fruit salad tree. Grafting Peach Trees is like real science, but anyone can do it. The problem was we had to wait for the correct time in the season to do it so I thought I would document the procedure for the benefit of others. The correct time to Graft trees especially stone fruit like apricot, peach, nectarine, and plums are at the start of Spring just before the buds begin to flower. You only have a few weeks time frame to do it so plan it in advance. You must also quickly do the graft as soon as possible after cutting off the donor tree as the cutting is starting to die as soon as its cut off the tree. Side view it should be in the shape of a V like a wedge. Whittle down each side of the donor branch, perfectly flat Cut down the middle of the recipient branch. Be careful. Insert the graft Push down fully Insert the Branch and fully tape up. After a few weeks, your tree grafts will take and start to sprout. Successful grafting procedure, the electrical tape is used to protect graft. After a few weeks, small shoots should start to appear. There are 3 techniques shown to me to be successful in Grafting Peach Trees. All 3 work sometimes better than others but I will explain them all so you can try them out. No technique is 100% you will have failures but its fine just graft a few extras in case of failure. Electrical tape is the bandage for your graft to hold it in place, stop moisture from getting in and keep germs or bacteria out. The 3rd procedure that is having great grafting peach trees success, is fairly straightforward. It’s basically creating a wedge out of the donor, and the recipient branch and adding them together. 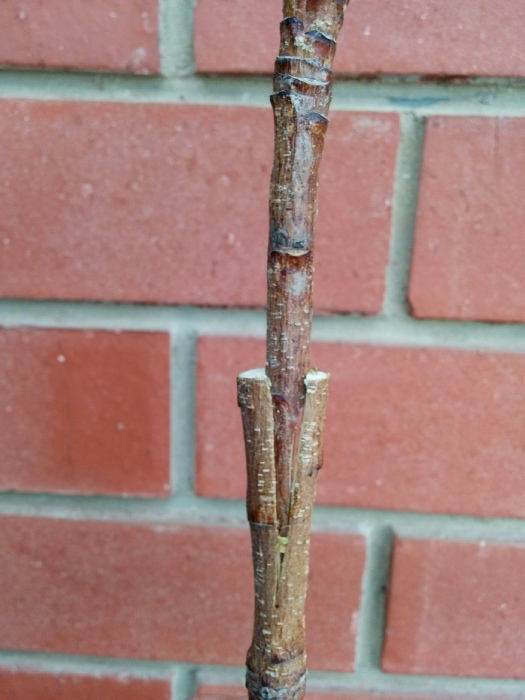 The only issue with this type of Tree Grafting is you need to wrap the graft really tightly to support it while it is healing. 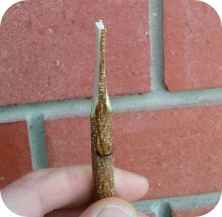 Any bit of movement in the graft will cause the splice to fail and die. If you do have some grafts not take, just leave them on the tree until next winter and then cut them off. This way you make sure they died. 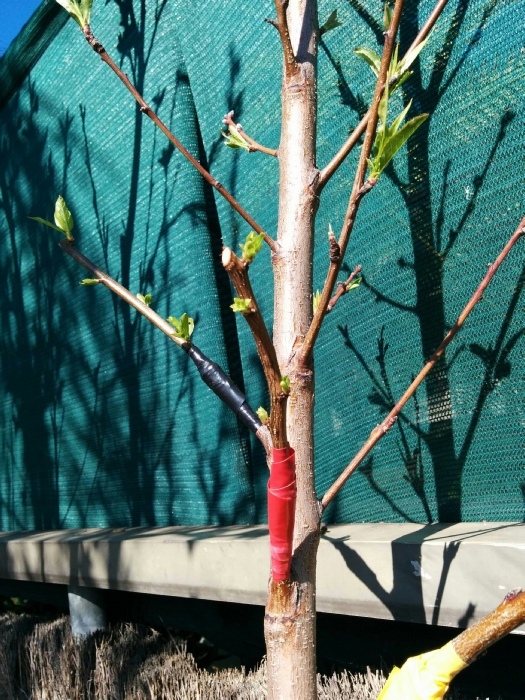 The T splice Grafting Peach Trees Procedure. Is another simple grafting peach trees procedure, that only separates the bark in the shape of a T.
Now you have to prepare the donor branch, we need to whittle down to a wedge but this time only do one side into a wedge. Insert the Donor branch into the prepared slot and push down tight, use honey to seal the wound and wrap tightly with electrical tape. Cut off some branches from the donor tree a few cuttings should be fine. They should be last years growth for best results, older branches don’t do so well. Approximate 3 buds long no longer than 5. They also should be the same size as the recipient’s branch. We are going to cut a V in the donor twig so whittle down each side to make a wedge approximately 4 cm long. Use your knife to cut into the center of the recipient tree down 4 cm and wedge apart gently. 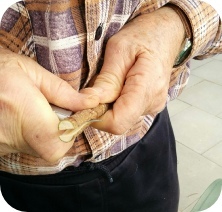 Be careful and do this step slowly and controlled so not to Graft your hand…. Insert the V wedge into the split of the recipient tree. Push all the way down. There should be no gaps in the splice. Use some honey or spit to coat over the join and then wrap with electrical or wax tape tightly. I use different electrical tape colors for the different type of tree grafts and experiments so I know what works and what doesn’t. I hope I have helped somebody create a masterpiece of wonderful fruit trees. Below is a guy that has grafted 40 types of fruit onto one tree. It’s the fruit salad tree. Simply Amazing. I hope one day to have such a tree. Grafting peach trees was something I will never forget and a great skill to learn. Remember only stone fruit can be grafted to other stone fruit trees, you cannot graft an orange to a peach tree. Like trying to mate a Lion with a Giraffe it’s just wrong. Water them well and enjoy your harvest. Grafting is so like witchcraft, some years great success some years not so. Thanks for this tips will definitely try them.